In 1548 he granted to him and Walter Moyle, the very advantageous purchase of the college of St. John Baptist of Stoke, near Clare, in Suffolk, and likewise all the messuages, tenements, &c. with the appurtenances belonging to the college of Corpus Christi, in the parish of St. Laurence Poultney, London, lately dissolved; together with divers other lands and tenements in the counties of Suffolk, Devon, Kent, and in London; for the sum of 958l. 3s. 5d. ob. a good penny-­worth, undoubtedly, as Mr. —Strype ob­ serves. The next year he obtained the house and site of the late priory of Spalding in the county of Lincoln, the manor of Hunden in the same county, and divers other Jands and tenements in the counties of Lincoln and Suffolk, to the yearly value of 118l. McL q. and no rent reserved. As we hear no more of church preferments given to him, it seems doubtful whether he ever was in orders, and it is certain that the canonry of Christ Church, mentioned in the text, might have been held by a layman at that time. He likewise caused him, by a mandamus, to be elected provost of King’s college, Cambridge, vacant by the deprivation of George Day, bishop of Chichester. 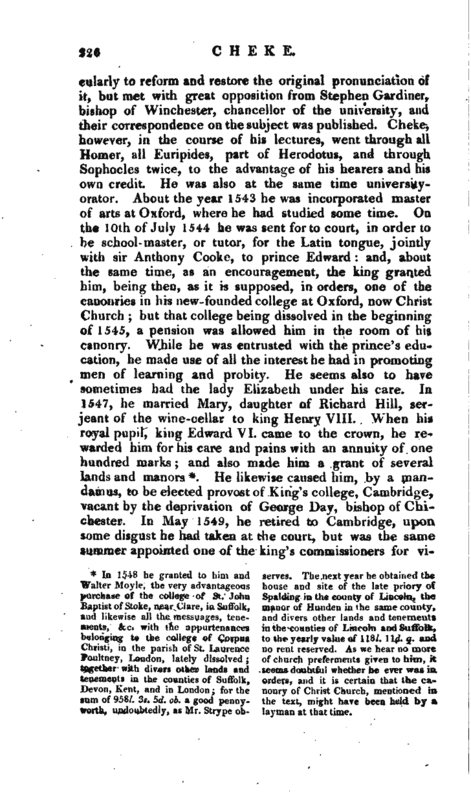 In May 1549, he retired to Cambridge, upon some disgust he had taken at the court, but was the same Summer appointed one of the king’s commissioners for | visiting that university. 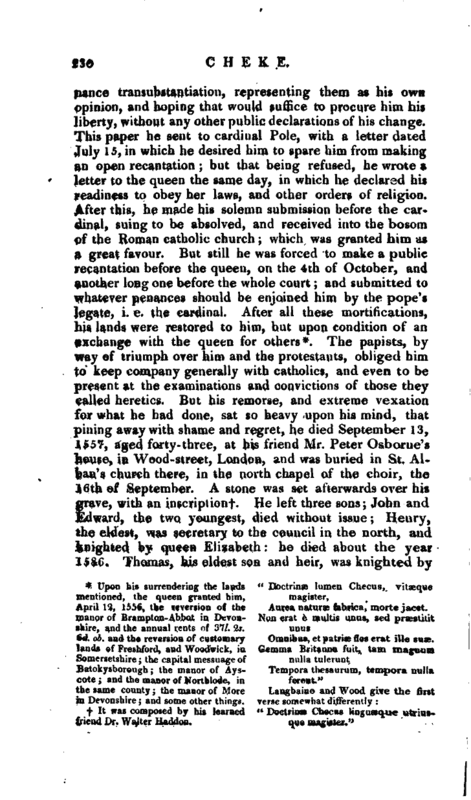 The October following, he was one of the thirty-two commissioners appointed to examine the old ecclesiastical law books, and to compile from thence a body of ecclesiastical laws for the government of the church; and again, three years after, he was put in a new commission issued out for the same purpose. He returned to court in the winter of 1549, but met there with great uneasiness on account of some offence given by his wife to Anne, duchess of Somerset, whose dependent she was. 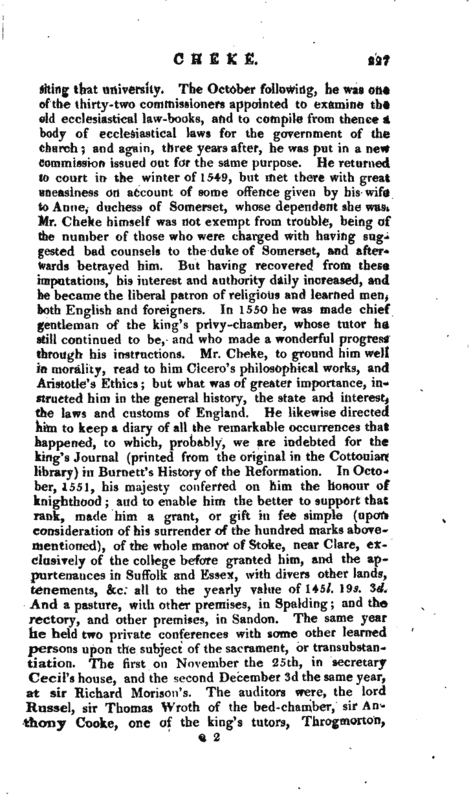 Mr. Cheke himself was not exempt from trouble, being of the number of those who were charged with having suggested bad counsels to the duke of Somerset, and afterwards betrayed him. But having recovered from these imputations, his interest and authority daily increased, and he became the liberal patron of religious and learned men, both English and foreigners. In 1550 he was made chief gentleman of the king’s privy -chamber, whose tutor he still continued to be, and who made a wonderful progress through his instructions. Mr. Cheke, to ground him well in morality, read to him Cicero’s philosophical works, and Aristotle’s Ethics; but what was of greater importance, instructed him in the general history, the state and interest, the laws and customs of England. He likewise directed him to keep a diary of all the remarkable occurrences that happened, to which, probably, we are indebted for the king’s Journal (printed from the original in the Cottonian library) in Burnett’s History of the Reformation. In October, 1551, his majesty conferred on him the honour of knighthood; and to enuhle him the better to support that rank, made him a grant, or gift in fee simple (upon consideration of his surrender of the hundred marks abovementioned), of the whole manor of Stoke, near Clare, exclusively of the college before granted him, and the appurtenances in Suffolk and Essex, with divers other lands, tenements, &c. all to the yearly value of 145l. 19$. 3d. And a pasture, with other premises, in Spalding; and the rectory, and other premises, in Sandon. The same year he held two private conferences with some other learned persons upon the subject of the sacrament, or transubstantiation. The first on November the 25th, in -secretary Cecil’s house, and the second December 3d the same year, at sir Richard Morison’s. The auditors were, the lord Russel, sir Thomas Wroth of the bed-chamber, sir Anthony Cooke, one of the king’s tutors, Throgmorton, | chamberlain of the exchequer, Mr. Knolles, and Mr. Harrington, with whom were joined the marquis of Northampton, and the earl of Rutland, in the second conference. The popish disputants for the real presence were, Feckenham, afterwards dean of St. Paul’s, and Yong; and at the second disputation, Watson. The disputants on the other side were, sir John Cheke, sir William Cecil, Horn, dean of Durham, Whitehead, and Grindal. Some account of these disputations is still extant in Latin, in the library of Mss. 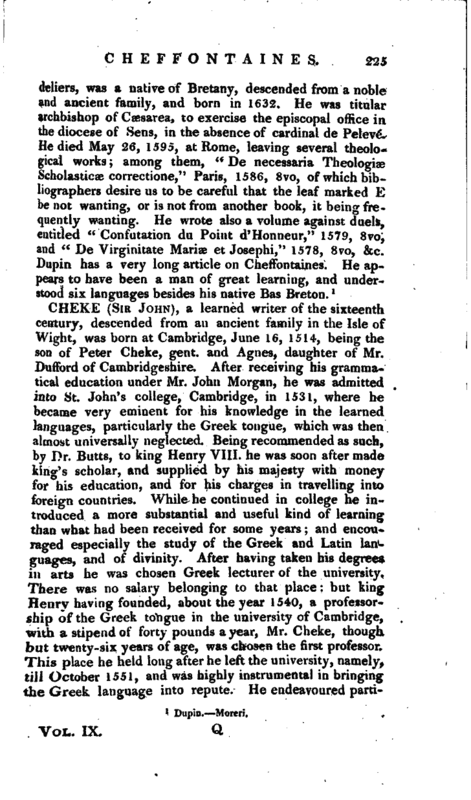 belonging to Bene’t college, Cambridge and from thence published in English by Mr. Strypein his interesting Life of sir John Cheke. 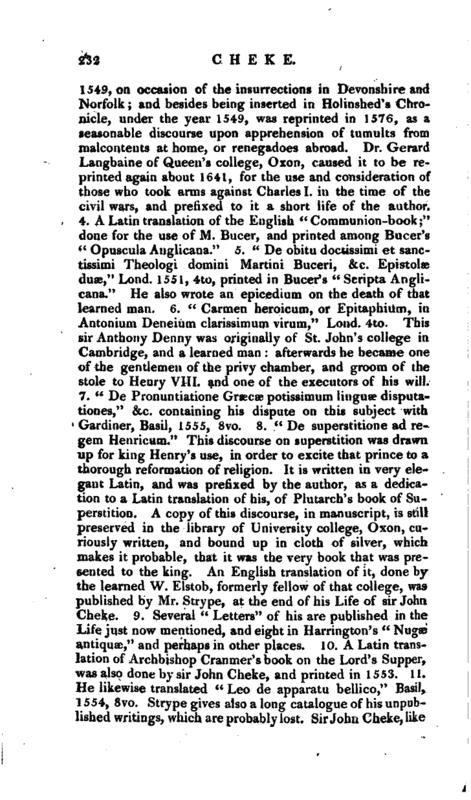 Sir John also procured Bucer’s Mss. and the illustrious Leland’s valuable, collections for the king’s library but either owing to sir John’s misfortunes, or through some other accident, they never reached their destination. 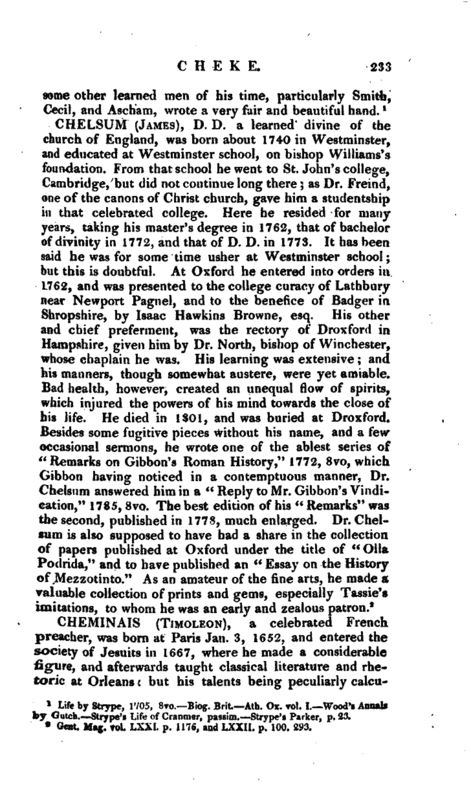 Four volumes of these collections were given by his son Henry Cheke, to Humphrey Purefoy, esq. one of queen Elizabeth’s council in the north, whose son, Thomas Purefoy, of Barvvell in Leicestershire, gave them to the famous antiquary, William Burton, in 1612 and he made use of them in his description of Leicestershire. Many years after, he presented them to the Bodleian library at Oxford, where they now are. 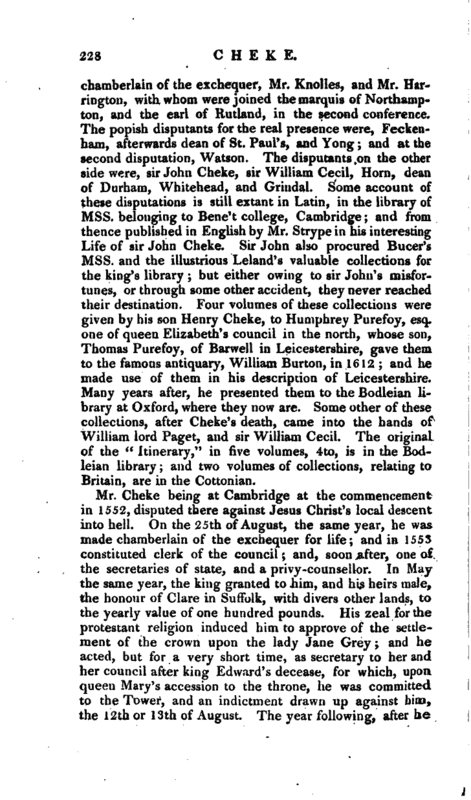 Some other of these collections, after Cheke’s death, came into the hands of William lord Paget, and sir William Cecil. The original of the “Itinerary,” in five volumes, 4to, is in the Bodleian library; and two volumes of collections, relating to Britain, are in the Cottonian. Mr. Cheke being at Cambridge at the commencement in 1552, disputed there against Jesus Christ’s local descent into hell. On the 25th of August, the same year, he was made chamberlain of the exchequer for life; and in 1553 constituted clerk of the council; and, soon after, one of the secretaries of state, and a privy-counsellor. In May the same year, the king granted to him, and hb heirs male, the honour of Clare in ’Suffolk, with divers other lands, to the yearly value of one hundred pounds. His zeal for the protestant religion induced him to approve of the settlement of the crown upon the lady Jane Grey; and he acted, but for a very short time, as secretary to her and hercouncil after king Edward’s decease, for which, upon queen Mary’s accession to the throne, he was committed to the Tower, and an indictment drawn up against him, the 12th or 13th of August. The year following, after he | was almost stripped of his whole substance, he obtained the queen’s pardon, and was set at liberty September 3, 1554. 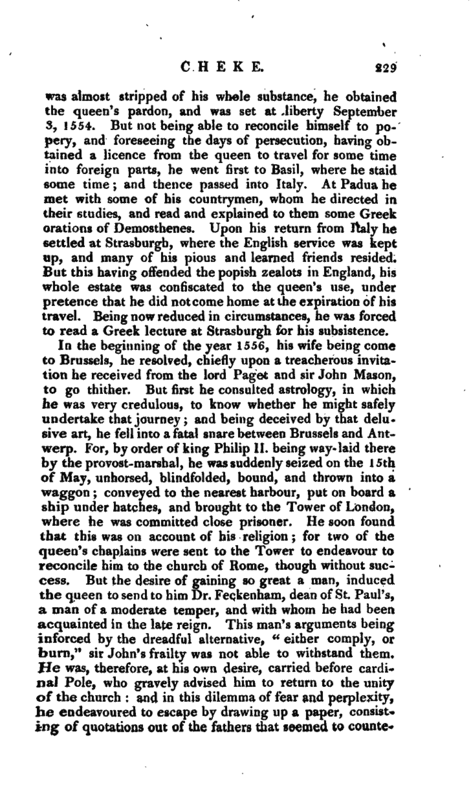 But not being able to reconcile himself to popery, and foreseeing the days of persecution, having obtained a licence from the queen to travel for some time into foreign parts, he went first to Basil, where he staid some time; and thence passed into Italy. At Padua he met with some of his countrymen, whom he directed in their studies, and read and explained to them some Greek orations of Demosthenes. Upon his return from Italy he settled at Strasburgh, where the English service was kept up, and many of his pious and learned friends resided. But this having offended the popish zealots in England, his whole estate was confiscated to the queen’s use, under pretence that he did notcome home at the expiration of his travel. Being now reduced in circumstances, he was forced to read a Greek lecture at Strasburgh for his subsistence. April 12, 1556, the reversion of the Aurea naturas fabrica, morte jacet. 6rf. ob. and the reversion of customary Omnibus, et patria? flos erat ille suae. cote; and the manor of Northlode, in ferent." f- It was composed by his learned “Doctrine Checus linguaeque utriusfriend Dr. Walter Haddon. que magister.” | James I. He purchased the seat of Pyrgo near Romford in Essex, where he and his posterity were settled several years. He was buried March 25, 1659, in St. Albau’s, Wood-street, near his grandfather. Sir Thomas’s second son, Thomas, commonly known by the name of colonel Cheke, inherited the estate, and was lieutenant, of the Tower in the reigns of Charles II. and James II. This Thomas had two sons, Henry, who died young, and Edward, who succeeded him in his estates. 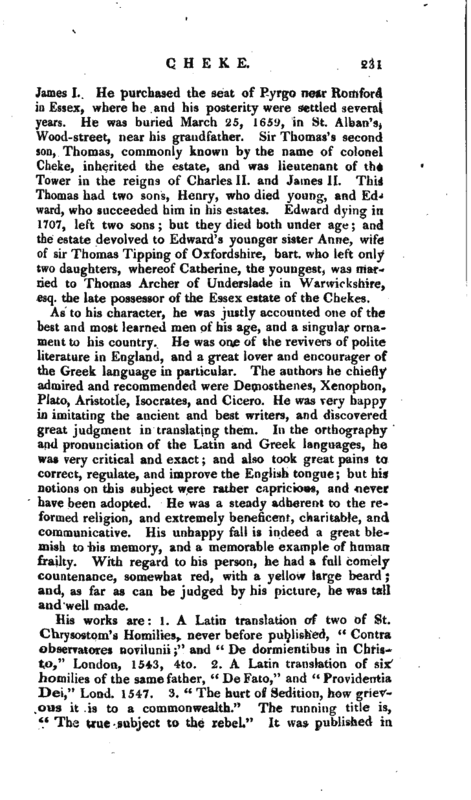 Edward dying in 1707, left two sons; but they died both under age; and the estate devolved to Edward’s younger sister Anne, wife of sir Thomas Tipping of Oxfordshire, bart. who left only two daughters, whereof Catherine, the youngest, was married to Thomas Archer of Underslade in Warwickshire, esq. the late possessor of the Essex estate of the Chekes. As to his character, he was justly accounted one of the best and most learned men of his age, and a singular ornament to his country. He was one of the revivers of polite literature in England, and a great lover and.encourager of the Greek language in particular. The authors he chiefly admired and recommended were Demosthenes, Xenophon, Plato, Aristotle, Isocrates, and Cicero. He was very happy in imitating the ancient and best writers, and discovered great judgment in translating them. In the orthography and pronunciation of the Latin and Greek languages, he was very critical and exact; and also took great pains to correct, regulate, and improve the English tongue; but his notions on this subject were rather capricious, and never have been adopted. He was a steady adherent to the reformed religion, and extremely beneficent, charitable, and communicative. His unhappy fall is indeed a great blemish to his memory, and a memorable example of human frailty. With regard to his person, he had a full comely countenance, somewhat red, witfi a yellow large beard; and, as far as can be judged by his picture, he was tall and well made. Life by —Strype, 1705, 8vo.—Biog. Brit Ath. Ox. vol. I.—Wood’s Annalls by Gutch.—Strype’s Life of Cranmer, passim.—Strype’s Parker, p. 23.